SHOULD MASSACHUSETTS establish mandated nurse-to-patient ratios in law for all the state’s acute care hospitals? This 25-year-old conflict between the Massachusetts Nurses Association and Massachusetts Hospital Association will be determined at the polls on November 6 as Question 1. We are university professors who care about Massachusetts health care policy. We both connect with Massachusetts’ leading health care consumer advocacy organizations who worry about access, cost, and quality in Massachusetts’ health care system—and we don’t speak for them. We have advocated publicly for better pay, working conditions, and training for health care workers in hospitals and nursing homes. We know the vital importance of organized labor as representatives of health care workers to meet their needs and to promote a higher quality care for patients. We are not eager to take a position opposed to the Massachusetts Nursing Association. FOR THE BETTER part of this decade, Massachusetts had been on a roll regarding its health system’s performance. Since passage of the 2006 universal health insurance law, we’ve been tops in having the lowest number of uninsured the nation. Recent national surveys on cost, quality, access, and public health from the Commonwealth Fund, the United Health Care Foundation and others show the Bay State to be best or among them. As Michael Widmer noted in his October 7 Upload piece, over the past five or so years, even the state’s performance on controlling costs has also been a national standout. Still, history teaches that these trends can turn downward on a dime. And self-congratulations can obscure lingering and insidious system weaknesses. The current controversy over the proposed merger of Beth Israel Deaconess Medical Center, Lahey Health, and other hospitals and physician organizations into “Beth Israel Lahey Health” (BILH) brings into sharp relief underlying systemic problems that are getting worse, not better. Author John McDonoughPosted on October 13, 2018 Categories Health Policy, Health Politics, Health Stew, Massachusetts Health CareTags Beth Israel Lahey Health, BILF, Gov. Charlie Baker, hospital merger, Partners1 Comment on What Does the Beth Israel/Lahey Health Merger Tell Us? The years 2013 through 2016 were excruciating for the Massachusetts Health Connector. In 2013, the Connector was among the nation’s most troubled federal/state health insurance exchanges, as it endured an epic collapse of its new website to help consumers purchase individual health insurance. Since then, it has taken a step-by-step and low-key “no news is good news” approach to rebuilding trust and credibility with its 252,000 clients. Now the silent period is ending. In 2006, Massachusetts was the first and only state to enact an individual health insurance mandate, the essential model for the federal individual mandate included in the Affordable Care Act (ACA) in 2010 and implemented in 2014. In last December’s Tax Cuts and Jobs Act, President Trump and Congress neutered the ACA mandate by reducing the financial penalty to 0. Despite widespread reports to the contrary, the mandate was not repealed, and the law, with its mandatory reporting requirements, remains on the books. On a Saturday morning in January 1967 Dr. Jean Cowsert, an African-American physician, was found shot to death in front of her home in Mobile, Alabama, after a stone had been thrown through her front window and she went out to investigate. Though police concluded that she had accidentally shot herself, in the months prior to her death she had been a key confidential informant to officials from the U.S. Department of Health, Education and Welfare (HEW) concerning the Mobile Infirmary’s publicized efforts to thwart patient desegregation of its facilities. A HEW official’s carelessness may have inadvertently disclosed her identity to desegregation opponents. Dr. Cowsert’s is one of many compelling stories in David Barton Smith’s powerful account of U.S. hospital desegregation in 1966, triggered by the convergence of national civil rights mobilization, the 1964 Civil Rights Act and the 1965 enactment of Medicare. In The Power to Heal: Civil Rights, Medicare, and the Struggle to Transform America’s Health Care System Smith tells how federal health officials—with backing from President Lyndon Johnson, HEW Secretary John Gardner, and other federal officials—mobilized to achieve a startlingly rapid transformation of America’s hospitals, erasing the stain of racial segregation that had always prevailed across the nation, North, South, East, and West. Smith’s account stands in vivid contrast to the equally compelling and failed story of American public school desegregation, best told in the 1976 Pulitzer Prize-winning Simple Justice: The History of Brown vs. Board of Education and Black America’s Struggle for Equality by Richard Kluger. In that case, the 30-year struggle to overturn “separate but equal” racial segregation in public education, culminating in a landmark 1954 U.S. Supreme Court’s 9-0 decision in Brown v. Board of Education, to this day has been mostly unachieved. A bold court decision was fatally undermined by a subsequent enforcement ruling committing the nation to an unsuccessful implementation strategy called “with all deliberate speed.” The contrast between successful desegregation of U.S. hospitals versus failed desegregation in public education is instructive. A bold court decision was fatally undermined by a subsequent enforcement ruling committing the nation to an unsuccessful implementation strategy called “with all deliberate speed.” The contrast between successful desegregation of U.S. hospitals versus failed desegregation in public education is instructive. As with so many aspects of American society prior to the 1960s, segregation ruled. A 1952 report by the South Conference Education Fund titled “The Untouchables: The Meaning of Segregation in Hospitals” documented 12 deaths of African Americans denied admission to white-only hospitals governed by white physicians and white dominated medical associations. In most of the nation, black-only hospitals were under-staffed, under-financed, and under-equipped. Beginning in the 1940s, black health professionals who were systematically excluded from the white medical mainstream, supplied backbone in the struggle for civil rights in hospitals, in schools and across American society. Theodore Roosevelt Mason Howard, MD, Sonnie Wellington Hereford III MD, Reginald Hawkins DDS, W Montague Cobb MD PhD, Charles Watts MD, George Simkins Jr. DDS—these are long-forgotten names of physicians who stood up for justice in their communities and in courts. Though the 1946 Hill-Burton Act banned racial discrimination in new and expanded hospitals for which it provided ample federal funds, the law explicitly sanctioned “separate but equal” facilities. A 1962 federal lawsuit, Simkins vs. Moses Cone, attacked the constitutionality of that provision, winning crucial support from the Kennedy Administration, and upheld by the U.S. Supreme Court in March 1964 just as Congress was passing that year’s landmark Civil Rights Act. That law’s Title VI, for the first time, prohibited using federal funds for racial segregation. Passage of the bold 1964 law, though, was insufficient to compel hospital desegregation. The critical catalyst was the passage of Medicare in July 1965 providing many millions of dollars in payment for medical services for senior citizens for the first time. Though Title VI clearly applied, its remedies and enforcement powers were meager. The question became: Would President Lyndon Johnson enforce Title VI compliance in Medicare by blocking payments to racially segregated hospitals? An initial push for voluntary desegregation failed as surveys conducted by civil rights activists had proven in mid-1965. With only six months until the July 1, 1966, inauguration of Medicare, “Gardner was launching perhaps the riskiest domestic policy initiative in the nation’s history. It tied together the fate of Johnson’s two signature pieces of legislation—the Civil Rights Act and Medicare,” Smith writes. In December 1965, HEW Secretary Gardner distributed a memo declaring that Medicare compliance with Title VI “is too important to be treated as anything less than the highest of priorities in our total program,” committing staff and resources to the task. With only six months until the July 1, 1966, inauguration of Medicare, “Gardner was launching perhaps the riskiest domestic policy initiative in the nation’s history. It tied together the fate of Johnson’s two signature pieces of legislation—the Civil Rights Act and Medicare,” Smith writes. The challenges were daunting. A January 1966 review concluded that at least two-thirds of Southern and border state hospitals were out of compliance, while many Northern hospitals operated as de facto segregated facilities. Gardner’s team quickly concluded that success would require “no ‘all deliberate speed’ pass for hospitals wishing Medicare funds. No money should go to any facility where race played any role in the treatment of patients, employees, or medical staffs.” Compliance was handed to HEW’s Public Health Service managed by U.S. Surgeon General William H. Stewart and the new HEW Office of Equal Health Opportunity. But with months before Medicare’s rollout and more than 4,000 noncompliant hospitals, how could they achieve this seemingly impossible task? Not all changes were welcome. According to Smith, “within two decades of the implementation of Medicare, all but four of the more than 400 20th century historically black hospitals had closed or converted to other purposes.” The Office of Equal Health Opportunity was disbanded by President Richard Nixon. And the problems of racial and ethnic inequities and disparities in health and health care are enduring national concerns. Still, the rapid and effective desegregation of U.S. hospitals is one of our nation’s—and our health care system’s—shining moments. Smith’s book is the authoritative source to understand the political, social, economic, and cultural context of this transformation. 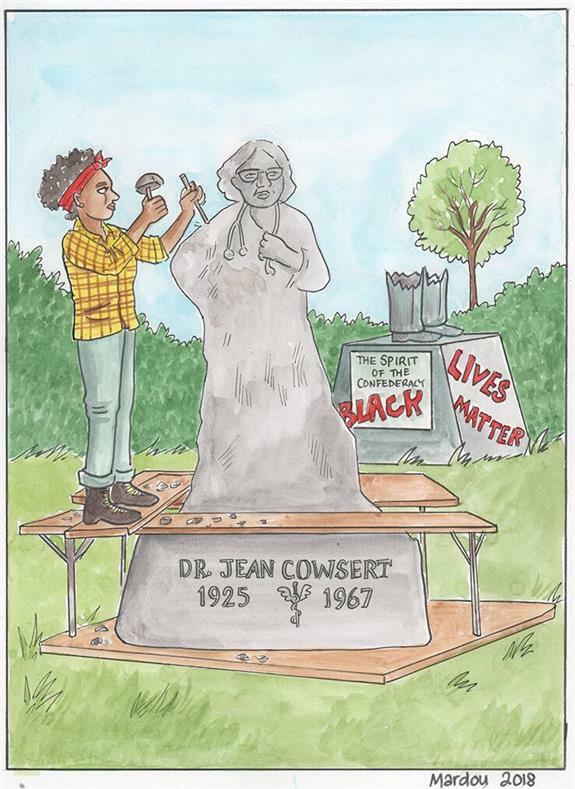 Perhaps as monuments to Confederate generals are demolished, we might find space for a monument to Dr. Jean Cowsert. The Congressional effort to repeal and replace the Affordable Care Act (ACA) has stalled, sparking urgent questions about what’s next and whether a bipartisan agreement could be achieved to address important U.S. health reform needs. We believe that critical matters relating to health reform must be addressed quickly and that bipartisan approaches are possible. We are health policy analysts and advocates who join in this agreement. While we hold diverse political views and policy outlooks, we believe that health reform solutions exist that can transcend partisanship and ideology. As the nation considers the utter collapse of the Better Care Reconciliation Act (BCRA), advanced by Senate Majority Leader Mitch McConnell, to repeal and replace the Affordable Care Act (ACA), some perspective is in order. Since President Trump’s Nov. 8 election, I have heard many people’s distress about the dire threats to the ACA that initially seemed so certain last November. First, Michael Reich, my colleague at the Harvard T. H. Chan School of Public Health who has worked on national health reforms all over the globe, reminds me that the moment of truth, the acid test, for any health reform happens when the government that created it leaves office and is replaced by a new government, and the new leaders must decide for themselves what will stay or go. As we have witnessed since November, this is not just a choice for a new administration; it is a choice for Congress and for American society. Since the election, Americans have had to confront a dilemma — namely, what do they care about regarding the Affordable Care Act and what are they prepared to do to defend it? After the election, with shocking abruptness, polls on the favorability of the Affordable Care Act began to increase after years of being stuck in 40 percent purgatory. Suddenly, Americans began focusing on policies such as banning pre-existing condition exclusions, expanding Medicaid, requiring coverage of essential health benefits such as maternity care, prescription drugs and much more.